Here at Carpet Tiles Next Day we have a great range of high performance, low maintenance grey carpet tiles among which you will be able find an option suitable for any environment. Our grey tones range from a light grey loop pile, through the mid greys to nylon or polypropylene darker greys. Along with the different colour choices we can also offer a selection of pile types. Wherever your area is situated at home or in industrial premises or meeting places we can offer a price conscious and durable alternative to other types of flooring. All of our grey carpet tiles are constructed with a 3mm bitumen backing, this provides a basic level of sound deadening and insulating properties. Grey is the most commonly seen colour carpet tile utilised for commercial situations, this we believe is because they are particularly good at camouflaging dirt and particles that often cause problems in busy offices, corridors, hallways, foyers and meeting rooms. Grey is also a wonderful base colour for flooring, allowing you a larger choice of colour combinations for your selection of décor. In our Fine Rib range the grey option is our Galaxy Grey, this finely corded misty mid grey shade carpet tile is a good value all-rounder. In the home they are ideal for utility rooms, kitchens or conservatories, providing a hard wearing alternative to carpet. The Galaxy Grey may be used just as successfully in industrial and retail premises, they can be laid to produce patterns alongside other shades in our Fine Rib range, one eye-catching idea is to mark out the pathways normally taken by customers around a public area. The lightest grey carpet tile that we stock is our Rivoli Light Grey, a versatile silver grey polypropylene Loop Pile carpet tile, these and the Rivoli Grey, which are a mid-grey with a darker grey fleck, are from the same range. These entry level polypropylene loop pile carpet tiles are hard wearing and stain resistant, which makes them favourable in many situations. Our Garda Grey carpet tiles are a mid to dark grey polypropylene loop, filling a gap in our range for those who need darker flooring, perhaps in engineering businesses or gyms. They are a popular mid value range carpet tile for those with a medium budget. When needing a grey for your office where castor wheeled chairs are running backwards and forwards, our option and our best seller, are the Quartz Grey carpet tiles. These are a handsome tile with dark grey being the dominant colour, but woven through with threads of mid and lighter greys and silvers. They provide a professional looking and safe area for staff to work in, while giving the peace of mind that they have not cost the business a fortune. In our nylon range we carry two choices in grey carpet tiles, the first being Galleon Grey, similar in shading to the Quartz Grey, the second is the Atlas Grey a rich dark grey, both tiles have the added benefit of being produced in the softer and even more durable nylon yarn. The nylon fibres of these carpet tiles have the ability to spring back into place when pressure is released, so the flattening that will eventually occur with the polypropylene tiles after several years, will be delayed even longer with the use of the Galleon Grey or Atlas Grey. Ideal for large offices with many desks, the slightly more expensive outlay will be paid back in full by their longevity. 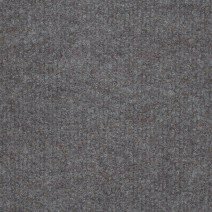 We have in stock at the moment a plain darker grey choice of carpet tile in the Velour Cinder Grey. This is the very best value we can offer for a grey shade, using this versatile 100% polypropylene carpet tile is the best option if you have a tight budget to adhere to. They are very hard wearing and easy to lay and maintain. Ideal for many situations, churches or social areas where there is some heavy footfall but not constant, suitable for corridors or meeting rooms in businesses or garden rooms in a domestic situation.